Displaying 61 - 84 of 84 items found. Blue and white prints add interesting dimension to this beginner quilting pattern. Its small size makes it perfect for topping a table -- or keeping a lap warm. Choose a different shade of fabric to make this quilt truly unique. Select a variety of light and dark scraps to piece this quick bed quilt. This e-pattern was originally published in Creative Scraps: Quilting With Bits & Pieces. Size: 85" x 100". Block Size: 15" x 15". Fuse a panel motif to a pieced background to make these scary Halloween accents. 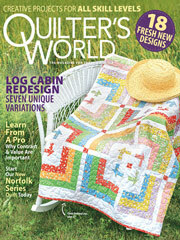 This e-pattern was originally published in the October 2009 issue of Quilter's World magazine. Size: Wall Quilt: 29" x 29". Table Topper: 22 1/2" x 22 1/2". Block: 6" x 6". Make a baby shower or a wedding reception really special with DIY decorations. Use this free beginner quilting pattern and a few coordinating fabric scraps to stitch a colorful banner. After the party, you could use this banner to decorate a nursery or a craft room! Size: About 108" x 4 1/4". Make a wall quilt for your kitchen or breakfast nook using bright, cheerful colors. Have a cup of tea while you search your fabric stash for perfect fabrics. Quilt size 24" x 30". Stitch a set of six pieced jewel-tone pot holders with a stained glass look using purple, blue and yellow fabrics. This e-pattern was originally published in 101 Fun-to-Quilt Pot Holders. Bright primary colors against a white background make this free quilting pattern unique. Easy to piece and fun, this bed quilt would be perfect for a guest bedroom -- or for a young girl or boy! Size: 72" x 104" bed quilt.